Used to be THE go to lure in the day. I caught many flathead and tailor on the chrome 1/4oz models and a few on the 1oz models. I still have a couple somewhere. I also have some coloured ones that caught a few trout in the day. An Aussie classic! 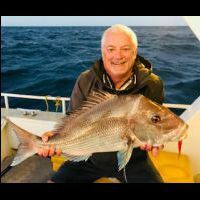 Hi everyone We decided to take our boat out to botany bay on Saturday and see if we could catch a few fish for a feed. We loaded up on yakkas and then proceeded to downrig them around a few markers, Mollineoux Pt and the Bare Island bommie. We had no luck at any of these spots. At this stage we found a spot to anchor up and soak a few baits. After we got a good burley trail going we started to get some hits. Most fish were undersize Trevs and Snapper with the odd Bream thrown in the mix. We had a live yakkas out but something kept biting their heads off. I decided to not waste our headless yakkas and filleted them up. We sent yakka fillets down into our berley trail. We started to get takes form Kingies every now and again as the school would pass by. Sometimes we had double hook ups. We landed a few and lost few. The biggest for the day was lost on the anchor rope. We kept four legals 65-68cm and released 8 or 9 just undersize models. We also landed a 54cm Tailor. We lost a few more Tailor due to being bitten off near the hook. We called it a day after that and headed back to the ramp. Here is a couple of pics. The little guy is my godson Thomo. G’day all, had a very small window to fish a tide change in a well known location in Brisbane Waters and marked some good fish on the sounder. Managed a nice soapie on a 4inch zman swimmerz in Pearl White my pretty much go to lure at the moment. Have had a couple of sessions now with not a fish boated but that is fishing for Jew on lures very frustrating, good to get that smell on the boat. Hearing good reports out of the Hawkes so I hope it’s a better few months then this time last year. Line strength and drag capacity have little to do with the size of fish you can catch with an outfit. You can catch 1m+ jewfish on 6lb braid with 2lb of drag and you can catch leatherjacket on 100lb braid with 40lb of drag if you wanted. The difference is how you can play the fish. When you are fishing light line and drag you can't just pull the fish towards you, because the line will snap or the drag will stop you from getting any ground. You will have to use your rod to lead the fish to swim towards you, and slowly tire the fish out until it's safe to bring it to you. When you are fishing heavy line and drag you can just crank the fish up no worries, but I would say it's just not as fun. The 2 problems with light line fishing is that it's easy to get spooled, and it's easy for fish to wrap you around something and snap you off. If you really think about it, if you are fishing in a perfect infinite sand flat with nothing sharp or pointy and have unlimited line, you could catch a marlin on 10lb line, because there'd be nowhere for it to go. But unfortunately such a perfect marlin filled sand flat doesn't exist, so you need to adapt your gear to your situation. The general rule with drag is to set it to about 1/3rd of your line breaking strain, so you could go up to 50-60lb with that reel, though I wouldn't recommend it because that's not what a 4000 size reel is designed to hold. With 50lb braid there are very few species you couldn't catch with a bit of patience, so you don't have to worry about catching too big of a fish. The only issue would be cooking your drag washers, which is extremely rare, and getting spooled, which is also uncommon if you know what you are doing and haven't hooked the Queen Mary 2. That time during a decent fight is what I call "reel time". Enjoy every moment of the "reel time" as it is the culmination of all the time and effort spent purchasing, preparing, driving, walking etc. Hi Blackfish mine was in 1974 and I was told it was a "fluke" as Flathead didn't take lures! I caught a second, almost identical sized one a week later off the same rock and again was told it must have "landed in it's mouth"- this time I saw the flattie come flying in from the side and grab the lure in front of me and was convinced you could fish for them with lures. Hi BN the Wonder Wobblers initially came in either chrome or gold in 1/4 oz and 1 oz and as Baz said were the 'go to' lures in their day. Like Baz, I also have a couple of coloured ones, which were 'declared' Trout lures. The cod lure is more than likely the "Aeroplane Spinner" which was a series of 3 or 4 propellor blades, decreasing from large to small in size and was an all time favourite with Cod fisho's. Red on the outside and either green or brass on the inside, they have probably caught more really large cod than any other Aus made lure. To look at one you'd probably shake your head as they resemble nothing 'natural'. I've got a couple in the collection. A 'new' version of them was brought out by Hawk(almost identical to the original) and I've got one in the original packaging, however it isn't as highly regarded by collectors as the "Aeroplane"
Same issue i came across. I personally use shimano ace2? for drags. mx3 oil for small reel bearings. mx5grease for grease and saltwater reel bearings. Some fellas on here use Vaseline. Same here Waza, you bought back some memories. First lure caught Flathead was also on a Wonder Wobbler up at Umina Beach. Early 70's. I had run out of prawns and this fellow said his son had caught them on lures before. I was doubtful but 5 minutes later I had one. Tie a light stick to your rig, it will increase your catch significantly. Even better to get a battery power one, red light works best. Hairtails are attracted by light. Hi BN I love eating them! I cut them into about 8 inch sections and then fillet them, they're one of the easiest fish to fillet and you get every bit of edible meat without bones (great way to cook for kids also). I see that FrankS scrapes the silver off, and his cooking method sounds pretty tasty. I scraped the silver off the first couple of times but don't bother any more as I quite like it and you can just lift it off when cooked if you don't fancy it. Deep or shallow fried with either egg and breadcrumbs or simply flour they are delicious. More than once I've seen people argue over the last piece/s on the bbq also! Thanks Basil are they good eating? I have referred to your reply to bump73 and it's a waste of reading. Your interpretation of the rules are wrong and explains why you are a simple fisho. I'm glad you got yourself a rule book, enjoy reading it, other good reading on the rules and laws of the NSW DPI Fisheries is on their website, i'll even give you the link, you can search away on there for everything you need or may want to learn NSW DPI Fisheries website Also here's a link from DPI website about carp, enjoy the read CLICK HERE KOOKABURRA Thank you for your rude uninformative and incorrect replies and I hope you have enjoyed my post to you. Your posts are now being monitored. Not a good way to start your time here on Fishraider stirring the pot. Oh, and if someone wants to release a carp, so be it, there's no law that says they can't at the moment, if they want to kill that carp humanely, then good on them also. Happy fishing. "Catch-and-release fishing for carpIs it illegal to return carp to the water? It is not currently illegal to immediately return captured carp to the waters from which they were taken (defence under section 216 of the Fisheries Management Act). However, carp are a noxious fish in NSW and Industry & Investment NSW encourages recreational fishers to retain and utilise any captured carp rather than returning them live to the water." It is not illegal to release carp but DPI encourage you not to. Kookaburra, you are wrong, pretty easy to find the correct info as i pasted above.